Everyone hears about those crazy stories about what happens in Vegas stays in Vegas. 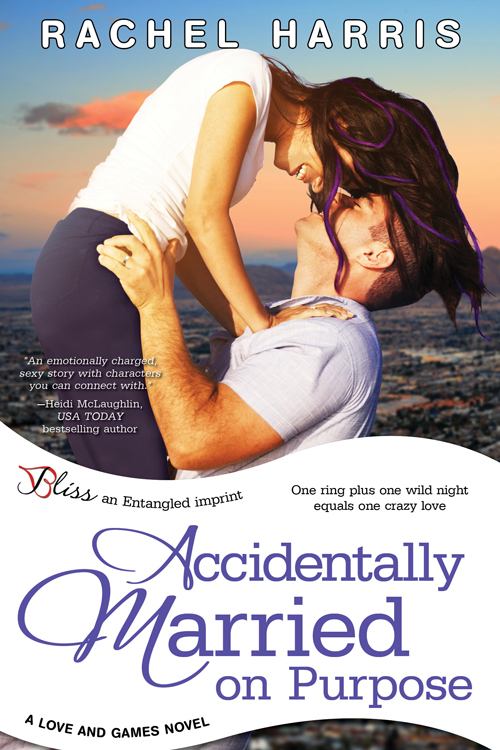 Sherry and Tyler realize in Accidentally Married on Purpose that is not always true. 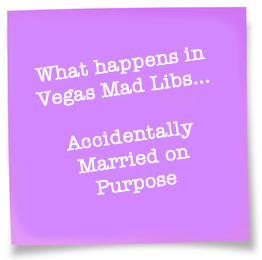 Join us in creating your own Vegas story in Mad Libs fashion. We would love to read your stories so copy and paste your story in the comments! Choose any type of drink. Once you’ve chosen all of your answers above fill them in where indicated below. On our trip to Las Vegas we stayed in 1 & 2 . I invited the 3 to have a 4 with me. We decided to go 5 together and when I asked him/her to marry me he/she said 6 ! We 7 all the way to the alter. The next morning I woke up and was filled with 8 . He/she bought me a 9 and won my heart. We lived 10-ly ever after. Did you get your happily ever after? Download a printable version here. Sherry Robicheaux loves men. She loves love. And she loves an adventure. So when she meets a mysterious man while working backstage at a country music concert in Vegas, she’s all about what happens in Vegas staying there. Country music superstar Tyler Blue just wants a weekend of anonymity…though there’s something about the spunky waitress with the streaks of purple hair that tempts him like no other. Until the next morning, when they both wake up with fuzzy memories…and rings on their fingers. Convincing Sherry to maintain the ruse for his public image isn’t the hardest part—it’s reminding himself that their time spent playing husband and wife in her small town of Magnolia Springs can’t last. Tyler’s first love will always be music—and the road is no place for a sweet downhome girl. On our trip to Las Vegas we stayed in Hunka Burnin Loves suite. I invited the bartender to have a Malibubu with me. We decided to go camping together and when I asked him/her to marry me he said “let’s do this thing!” We ate ice cream all the way to the alter. The next morning I woke up and was filled with happiness. He bought me a book and won my heart. We lived peacefully ever after. On our trip to Vegas, we stayed in the 5 o’clock somewhere suite. I invited the mystery man to have a chocolate milk with me. We decided to go ice skating together and when I asked him to marry me, he said. “Let’s do this thing!” We skipped all the way to the alter. The next morning I woke up and was filled with greed. He bought me a peanut and won my heart. We lived curiously ever after.